We appreciate your interest in renting a Fullerton College Fine Arts Performance venue. This guide will provide an introduction to the rental process, and guidelines that will help us to better serve you. Once you’ve decided on a facility, the first step is complete the rental inquiry form. Upon a successful discussion with the production coordinator, either a tour of the venue will be scheduled or requesting an official reservation will be recommended. Visit the Fullerton College Master Calendar page to make the official reservation online. A username and password will need to be created. Reservations may not be made over the phone. If you are an Fullerton College or North Orange County Community College group, skip to step five. If the reservation request is approved, an estimate of charges will be emailed within a few days. The estimate is based on costs are outlined on rate schedule page. They include the required staffing, equipment costs and the cost of the facility. The estimate based on both the info you’ve provide and our rules and regulations of the District and the Theatre Operations office. These requirements are outline on the terms and rate schedule page. Return the estimate and statement of responsibility signed along with the $150 non-refundable deposit to the production coordinator no more five days after receipt. Those groups which are requesting the non-profit rate must supply a section 501(c) (3) Internal Revenue exemption letter and their Employer Identification Number no less than two weeks prior to the first scheduled use date. The Production Coordinator will provide the contact information for the Technical Director. Contact the Technical Director to discuss the technical needs of the event. The Technical Director may request a production meeting(s). Production meetings must be scheduled and occur at least four weeks before the first day of theatre use. Paperwork, including lighting plots, ground plans and schedules may be required. The Technical Director will inform the production coordinator if any additional required needs based on the communication with them. Subsequently a new estimate will be generated and emailed. We require payment is received in full, based on the estimate provide. We must receive payment no less than two weeks prior to the event. Please arrive no earlier than the time as specified in the reservation. We recommend reviewing the following before the event date. Looking for a medium-sized facility? 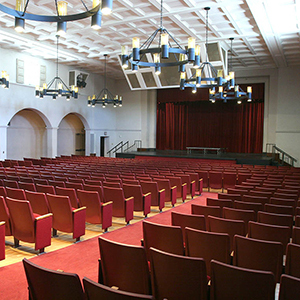 Wilshire Auditorium offers an moderate sized space with seating up to 400 and a medium sized stage.